FILE - Russian tennis player Maria Sharapova touches her racket at the end of her match against Colombian Mariana Duque Marino in Madrid, May 5, 2015. Russian star Maria Sharapova has been banned from playing professional tennis for two years for failing a drug test at the Australian Open in January. The lengthy suspension, backdated to January 26 when she last played, was handed down Wednesday by a three-person Tennis Anti-Doping Program tribunal appointed by the International Tennis Federation. Sharapova said she would appeal what she called "an unfairly harsh" punishment to the Court of Arbitration for Sport, but she will not be allowed to play during the appeal. At a news conference in Los Angeles on March 7, Sharapova admitted that she had failed the drug test in Melbourne on the day she lost in the quarterfinals to American Serena Williams. She tested positive for meldonium, a substance she has been taking for 10 years for health reasons. The World Anti-Doping Agency (WADA) added that drug to the list of banned substances only at the start of this calendar year. Sharapova said she did not look at an email with the updated ban list before taking her medication. Even if the penalty is reduced, it is nearly certain that Sharapova, 29, a five-time Grand Slam champion, will be unable to represent Russia at the Rio Olympics in August. The ban could have been as long as four years, and the International Tennis Federation said on its website that her penalty was being backdated to January because of her prompt admission of guilt when she first learned she had failed the drug test. The panel discovered Sharapova had not noted her use of meldonium — also known as mildronate — on any of the seven doping control forms she turned in from October 22, 2014, to January 26, 2016. Keeping her use of meldonium secret from her team and anti-doping authorities was "a very serious breach of her duty to comply with the rules,'' the panel said. 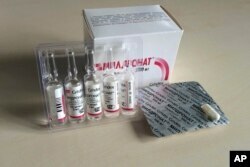 Tablets and vials of meldonium, also known as mildronate, are photographed in Moscow, March 8, 2016. Russian tennis star Maria Sharapova failed a drug test for meldonium at the Australian Open. Meldonium is manufactured in Latvia and used to treat diabetes, heart disease and low magnesium, but some researchers have linked it to increased athletic performance if taken in large doses. It is not approved in the United States or European Union, but is available in Russia and former Soviet Union countries. Close to 200 athletes have tested positive for the drug since January. WADA on Wednesday issued a statement saying it would review the panel's ruling and "subsequently decide whether or not to use its independent right of appeal to the Court of Arbitration for Sport." In March, WADA President Craig Reedie told The Associated Press that any athlete testing positive for meldonium would normally face a one-year suspension. Sharapova loses all her rankings points and prize money that she earned at the Australian Open. If she loses her appeal, her suspension will run through January 25, 2018. Besides the Rio Olympics, she would miss eight Grand Slam tournaments during what is likely the remainder of her prime playing years. During her career, which has in recent years been marred by numerous injuries, Sharapova has won 35 WTA singles titles since winning Wimbledon as a 17-year-old sensation in 2004. She has earned $36 million during that time, largely from endorsements. U.S.-based sportswear maker Nike dropped its sponsorship of Sharapova in March after she announced her positive test. Russian Tennis Federation President Shamil Tarpishchev told the Tass news agency that Sharapova would be replaced by Ekaterina Makarova on the country's Olympic team for Brazil. Makarova is ranked 36th this week, 10 places below Sharapova.